When Sarah Palin speaks, liberal feminists go wild. The woman is like a stilettoed catalyst for backlash from the professional political sisterhood. Much of the bitterness that gushes forth from the lefty ladies has very little to do with Palin herself. It's about many of the things she represents: She's a happy mom, surrounded by a big family and husband; she's pro-life, religious and conservative; and, lest we forget, a political powerhouse the likes of which has not been seen for decades. Depending on who you are and the nature of your gripe, you can add and subtract to this list. A most recent source of feminist madness over Palin stemmed from a speech she delivered at a Susan B. Anthony List fundraiser in Washington, D.C. The List is a group that supports candidates who are pro-life. It does so in the tradition of the early feminists who fought for life issues. The List, like other similar groups, including the group Feminists for Life, educates and promotes the largely forgotten or otherwise suppressed history of the women who fought for the 19th Amendment, which gave women the right to vote. These suffragettes were smart, at home with their femininity and perplexed by those who would deny the very power of life within them. In many ways, the women among the Tea Party activists of today -- whom Palin counts as part of a "mom awakening" going on -- would be quite at home with their foremothers. If polls I've seen and rallies I've attended are any indication, today's female fighters are pro-life and sensible. They've seen the pain the last few decades of social radicalism has wrought. They're a danger to the feminist establishment. And so in her speech, Palin talked about "a new revival of that original feminism of Susan B. Anthony." She said, "Together, we're showing young women that being pro-life is in keeping with the best traditions of the women's movement." Palin talked about "empowering women," and in her worldview that translates into making sure women know that they have options when they are pregnant in "less-than-ideal circumstances." She talked beautifully about her son Trig and the transcendent challenge of raising a son with Down syndrome. As the former governor of Alaska tends to do, Palin rallied the people about the future and their role in it. Referring to the recent health care debate and the failure of nearly every so-called pro-life Democrat to step up to the plate, Palin talked about how a "new pro-life, pro-woman majority will actually be pro-life when it counts, when those votes are needed." And so for days after, there was the usual anti-Palin march of derision. On the Washington Post's website, two Anthony aficionados asserted: "Sarah Palin is no Susan B. Anthony." They lamely criticized Palin for not providing enough footnotes in her speech to prove that Anthony cared all that much about abortion. As they worked to demonstrate that Anthony was indifferent on abortion, the Palin critics managed to conveniently skip over the other suffragettes and their writings in newspapers and letters. Like the letter Elizabeth Cady Stanton wrote to Julia Ward Howe in 1873 in which she explained, "When we consider that women are treated as property, it is degrading to women that we should treat our children as property to be disposed of as we see fit." One respondent to Palin argued: "Her usual rhetoric extolling the values and importance of freedoms doesn't extend to women." In the rhetoric and reality of the liberal feminist movement from which a comment like that is born, freedom doesn't extend to the unborn child. Increasingly, Americans are not tolerating this. In the tradition of the suffragettes, women, increasingly, will have none of it. And so I understand why women of the left react early and often to Palin. It's not about her, it's about the threat to their power she represents. They've based so much of their political activism on the tenets of the sexual revolution, which have been such a disaster for women, men, children, and families. But the jig is up. It didn't fly with the likes of Anthony and Stanton. And it's increasingly not flying now. It's not the pro-lifers who went rogue in the first place. Some news from today's Vaughn Ward event. Ward introduced Palin on Friday and said and her family arrived on time in Boise, but unfortunately their bags did not and the rally started about 30 minutes late. When Palin took the podium, she addressed the setback in a tie-dyed blue top and a knee-length black skirt. "We flew through the night and this morning my luggage didn't arrive. So about an hour ago, I was sitting backstage in sweats and tennis shoes and man, this is just so me. I'm in borrowed clothes, again... I appreciate the borrowed clothes though, this is nice," said Palin. 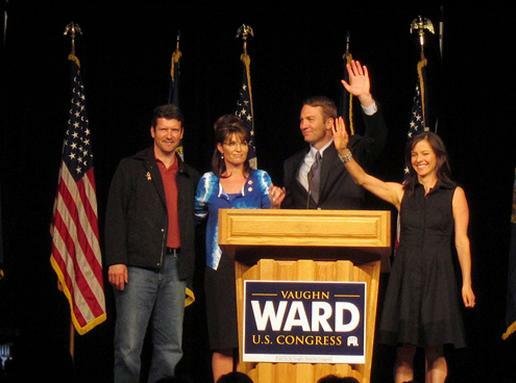 However, Mike Tracy, a spokesperson for Vaughn Ward, says clothes were purchased for Palin by a volunteer in the amount of $298.50. Tracy says Palin personally reimbursed the volunteer in that amount. A gallery of sorts and video here. Raw video of the whole speech is here. Ward did not speak other than to introduce Palin and the crowd went wild! Here are some of the quotes I tweeted during her speech. “I know Idahoans proudly cling to our guns and religion.” To huge applause. All and all a good time and the audience loved Palin. I wonder if she was able to change any undecided minds in the audience. My gut tells me, if there were any undecided in the audience she very well could have. This is a race again, Tuesday will be interesting. 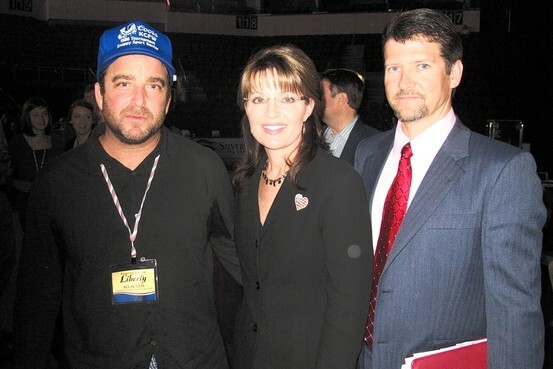 Oh, BTW, All the press about Palin protesters…..I saw 3 people. Hmm. In 2006, Frank went back to the idea he had been considering for 20 years, since his time in Alaska, and decided to make a series about women around the world. "I believe in the power of women and I wanted to develop a project that showed that. I made a film in Nepal about a nun - who is also a famous singer there - who established a school for nuns. In Israel I filmed a Bedouin woman who is helping to advance other Bedouin women, and then I went to Alaska to a place very near the North Pole and spent time at an aviation company of light planes, run by women. I joined them on flights to places where I, as an experienced pilot, wouldn't dare land." A short time later his "love story" with the woman who was, among other things, a symbol of the State of Alaska began: then-governor Sarah Palin. "After thorough research I got to Sarah Palin," recalls Frank, "because at the time she was the first woman elected to the position after 60 or 70 years of male rule. Not only that, she had succeeded in getting elected after fighting and defeating corruption. I contacted her and suggested interviewing her for the film. At first she hesitated." 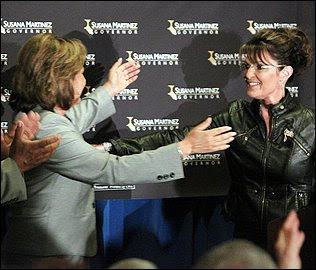 At the time Palin was in Washington, meeting with the Republican presidential candidate, John McCain, who was considering options for the vice-presidential slot. Nonetheless, Palin met with Frank, at his office in Los Angeles, and they chatted for two hours. What did you talk about ? "We talked about Alaska and I told her about the film. She said: 'Come to Alaska and we'll talk.' A month later I took my camera and went up. I spent three days with her one-on-one. I followed her schedule, everything she was doing. She never asked me to leave or to stop filming even when her aides wanted her to. She let me see how she ran her office. I also filmed her with her family, her husband, the children. Very intimate moments. She was open, friendly and genuine. She impressed me very much. She has 'star quality.' It doesn't matter what you think about her, she has an attractive image." In the media she didn't come across as a very intelligent woman. "Look, the air force gave me tools to analyze and diagnose. My impression of her was that she is a very 'cool,' pleasant woman, who knows how to ask the right questions." Frank completed the shooting and began to edit the material, when Palin was selected as McCain's running mate. "Through my agent we let it be known I had footage about her in hand - and then the rush began," he recounts. "All the television networks in the United States, and I'm not exaggerating, wanted to see the material. In the end I decide to go with the Fox network." "Because Palin had been with me 100 percent - I didn't want anyone to use my material against her, and I trusted the Fox network. From the footage I had, they made a film that got the highest viewer ratings in Fox's history." So thanks to Palin you've become involved with Fox News? "Yes, that's how my romance with the Fox network began, especially as I had become the No. 1 expert in the United States on Sarah Palin. They signed me up as a consultant - and Palin too." Are you in touch with her? "Not closely, but I am working to bring her to Israel." Man, I hope that works out. I'd love to see her take a trip to Israel. I walked in late for the Susan B. Anthony List breakfast last Friday and, right away, Sarah Palin blew me away. She hadn't planned to have a special-needs child. She was governor of the state of Alaska with four other children, for goodness sake. The thought of abortion flitted across her consciousness and she remembered God's promise that she could handle whatever He sends her. Sarah Palin says now -- and listening to her it is impossible to disbelieve -- "Trig has been the best thing that has ever happened to me and to the Palin family." The former GOP vice-presidential candidate is up on stage, rubbing her eyes in imitation of a sleepy toddler: "Trig, in the morning, he'll wake up -- he's 2 years old now -- he'll wake up and he pulls himself up to the top of the crib there. He looks around and he rubs his sleepy little eyes, and even though the day's going to be challenging, he starts applauding." The audience explodes in appreciative laughter, and Gov. Palin drives the message home: "First thing in the morning, he looks around clapping like, 'Woohoo! What are you going to do with me now?' And I -- oh man, shouldn't we all? That's what we're learning from our boy." It was an extraordinary speech. Sarah Palin is something genuinely new on the American scene, and what's more, she clearly knows it. Palin understands that she is building not just a new political movement, but a new cultural identity. She dubbed it "frontier feminism," and it was the theme she carried through from beginning to end. She speaks emotionally as a mother, from the heart of motherhood, and she makes it what it should be: a source of power, not an admission of weakness or dependency, and a bond, the deepest bond among women. "And I thank the SBA List, too, for being a home to a new conservative feminist movement, is how I look at this. It's an emerging conservative feminist identity. Far too long, when people heard the word 'feminist,' they thought of the faculty lounge at some East Coast women's college, right? And no offense to them, they have their opinions and their voice, and God bless them; they're just great." "But that's not the only voice of women in America. I'd like to remind people of another feminist tradition, kind of a western feminism. It's influenced by the pioneering spirit of our foremothers, who went in wagon trains across the wilderness, and they settled in homesteads. And these were tough, independent pioneering mothers, whose work was as valuable as any man's on the frontier. ... They went where no woman had gone before." "As an Alaskan woman, I'm proud to consider myself a frontier feminist like those early pioneering women of the West. "Now, maybe my jumping on the national stage was a bit of a shock to some people," Palin went on. "I know that some left-wing feminists, they sure didn't know what to make of an Alaskan chick out there talking about ... the Second Amendment and talking about raising family and kids -- the more the merrier -- and, you know, all that." She proceeded to thank one of the largest and most effective pro-life organizations in the country, the Susan B. Anthony List, named for a key 19th-century leader who opposed abortion. "I'm grateful to have a place like this, full of sisters who are not put off by a gun-toting, pro-life mom of a fun, full family -- never dull." Women can do anything. We can bear children under less than ideal circumstances. Like Sarah and her "strong and independent" daughter Bristol. 2010, Sarah Palin announced exuberantly, is the year "when commonsense conservative women get things done for our country." I don't know if it's true or not. But I'll tell you one thing: Sarah Palin had me at the word "Trig." And then the Fox and Friends guy pointed out that the bill specifically says that you cannot question someone based just on their race or even country of origin. They have to be actually doing something wrong, as in, breaking the law. For example, you speed, an officer pulls you over, and he asks for your driver's license, WHICH HE WOULD ASK FOR ANYWAY. You don't have one? There's reason to suspect that you're illegal? Well, then he can do something about it. Then Richardson jumps back in and says something like, "This is racial profiling and it's unconstitutional because you can't just randomly ask for someone's papers, that's unreasonable search and seizure, it's unconstitutional..."
He's right, that is unconstitutional. THAT'S WHY IT'S NOT ALLOWED. Are all Democrats this stupid? Since I seem to have ticked off Shannyn Moore fans, I'll go one more and tick off some Gryphen fans. I only pop in to Gryphen's site maybe once a week, if that, because it just leaves me sick to my stomach. But I noticed an interview that he did with Levi's sister a little while back. Needless to say, it was full of things that contradict what Mercede has said in the past and what Levi has said only recently. But, that's not the point. Basically, Sadie's mad that Bristol isn't letting her raise Tripp, or something like that. Oh, and the Palins of course are mean and vindictive and are out to get them. Or something like that. And apparently, People Magazine is in the Palin's pocket. I thought they were in Obama's pocket. It's a tabloid, for Pete's sake. From the way things sound, my bet is that they were getting ready to do a glowing piece on the Johnstons, but whatever. So, what about the custody thing and the seeing Tripp thing? First of all, the Johnstons are doing nothing but continuously shooting themselves in the foot with the approach that they're taking. I am obviously a huge Sarah Palin fan, and I could give them better advice. Levi, not getting a real job? Not finishing high school? Trashing the kid's family? Your mom and sister associating with the likes of Gryphen, Trig-Truther Extraordinaire? I can't think of a faster way to royally tick Bristol off and make it ten times harder to accomplish your stated goal of just being able to see Tripp. Levi should have filed for joint custody a very, very long time ago. He had a lawyer, for Pete's sake. Alaska tends to favor joint custody. I doubt honestly that Bristol will even get sole custody now. I'm actually hoping that they'll be able to smooth this over at some point so we can just move on from all of this drama. Of course, it's kind of hard to do that when your career is based on publicity that is only there if your name is associated with the Palins, and the best way to drum it up is to have a feud to feed the tabloid followers. As far as Sadie's accuracy goes, since Levi has said publicly that he gets to see Tripp at least once a week because he's finally playing by the rules and coughing up some dough, either Sadie's lying or Levi's lying. Or Levi is just not telling his sister some things because he knows that she and Bristol don't get along. It's probably the latter. Actually, Levi seems pretty happy with the way things stand now. He's just out to get as much money as he can out of this. Sadie also strikes me as being very dramatic about everything. One of those girls that I would have a hard time believing because they would tend to exaggerate. And quite frankly, this situation is not unusual. Countless other families go through this type of thing every day. The idea that they are soooo persecuted and deprived just cracks me up. I've got a niece and a nephew who live four hours from me. I haven't seen them in about three years. Why? Because my brother's busy, and I've been in college and working. He's got a wife, two kids and a job. He has a life. I have a life. Mercede should be thankful she sees Tripp as much as she does, especially since it's pretty clear that she and his mother don't have the best relationship in the world. If Levi had gotten his act together and they had worked out joint custody, Sadie could probably see Tripp on Levi's time. That whole thing where Sadie went and trashed Bristol in venues like Star Magazine probably didn't help the relationship very much either, but I digress. My mom wasn't too keen on some members of my dad's family. They weren't too keen on her (things are better now - this is when I was little), so she wasn't too crazy about me spending much time with them. I saw them maybe on Christmas and that was it. So? They were the "relatives," the ones you don't get to pick. They weren't my parents. I don't know if they cared or not, but I didn't. As long as I had Saturday morning cartoons, I was happy. Mercede ain't the mom, so it's kind of her tough noogies. I have other Aunts that I'm very close to, but I only see them a few times a year, if that. It's called life. It's normal. I'm sure countless other people have similar stories. Let's put this into perspective: Bristol works an eight-to-five job, she's raising a child, and she's living 45 miles away from Wasilla at this point. And, on occasion, she's traveling around doing her public gigs. If I put myself in Bristol's shoes, I'm thinking, "Get up, get kid ready, go to work, pick kid up, get kid ready for bed, crash, do it all over again, do some speeches because at some point I'd like to get through college and maybe buy a house and my ex's income is probably going to drop at some point and the child support payments right along with it..." My first priority would not be to drop whatever I was doing to suit my kid's Dad's sister that I don't even get along with anyway. There's probably a high level of jealousy involved as well. The Johnstons were perfectly happy to trumpet how wonderful the Palins were during the campaign when their wagon was hitched to their star. Lots of families have internal fights. They just don't get to run to the media to complain about them. Settle this in court like adults and stop with the victim routine, okay? It's bull, and it's getting old. Oh, and Gryphen, I think calling your blog "critical of Palin" is probably the understatement of the century. It's obvious that you hate the woman's guts. You know you're discovered a layer beneath "low" when you use a funeral as an excuse to trash Sarah Palin. Shannyn Moore apparently thinks it's appropriate to dig up the corpse of Wally Hickel and bash Sarah Palin over the head with it. This somehow honors Wally in her twisted little mind. It's too bad Shannyn feels the need to use an event like a funeral mass to feed her Palin-hating addiction. I love how she's all like, "Palin's so divisive, blah, blah, blah, so unlike Wally...." Earth to Shannyn! You're using a man's funeral as fodder for a divisive political column. Hello! Pot to kettle much? Sarah, Todd, and Piper went and paid their respects, along with many other Alaskans, at a mass for Wally Hickel yesterday. Predictably, Shannyn sees Piper as a "human shield." Oh, and she gets Piper's age wrong. Piper is nine years old, not eight. I pity the Palin-haters. I really do. I don't know what kind of twisted mind can seriously see anything negative in a nine-year-old girl accompanying her mother and father to a funeral. Didn't your parents ever take you to a funeral? The hater's parents must have never taken them anywhere. They must have been horribly neglected children. As for Wally's falling out with Palin, I don't blame either one of them, really. They each went the way they thought they had to go. I think that Wally was wrong about some things, but I have nothing against the man. I had nothing against him. Let him rest in peace. For Shannyn to even write an article making his remarkable life all about his split with Sarah is such a disservice. Todd, Sarah and Piper attended Wally Hickel's funeral last night here in Anchorage. I noticed that Frank and Lisa M, Sen Begich. Mayor Sullivan and other dignitaries sat up front but the Palins unobtrusively sat at the back of the room - many of the guests probably didn't know they were there. I have heard that Sarah and Wally were in contact last fall and had a reconciliation of sorts. I know Wally still thought that she had not done as he wished to some extent - but that's life. Oh, wow. Yeah, she really crashed that funeral. (chuckle) She probably couldn't have been more inconspicuous if she had tried. I'm not sure if she and Wally actually reconciled or not, but it wouldn't surprise me. "Our state has lost a great leader. What he has left behind will have changed all of our lives, and he spoke so often about energy and security, and energy and prosperity and the nation, and we must not forget that." Wow. How hateful. I can totally see why Shannyn felt the need to use Hickel's funeral to further her own political agenda. Remember when Sarah sent out a tweet for Wally and Geoffrey Dunn was like, "What, that's it? Just a tweet?" Trust me, if Sarah had not attended or had said nothing at all about Hickel yesterday, Shannyn would be screaming, "See how horrible she is! An icon, a founding father of Alaska died and she doesn't care! She's a horrible witch!" The Sarah Palin she hates doesn't even exist. She fears a Palin of her own mental making. And she trashes that mental image because without it she'd be nothing. Without Sarah Palin the haters are irrelevant. Nobody cares otherwise about anything they have to say. Elizabeth Mitton started putting her outfit together two days before her birthday party Sunday. “It’s a new dress that I have had for a while – it is polka dots,” she said last week. Once the big day arrived, however, she changed her mind, going with a classic black skirt that has been a staple in her closet. 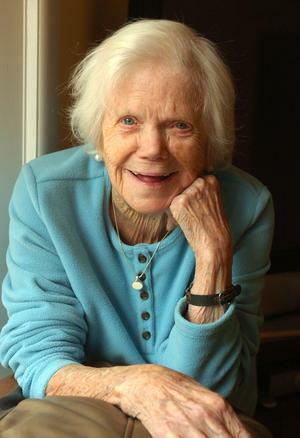 Mitton turned 100 on Monday – a “very healthy 100; I don’t even take an aspirin,” she is quick to tell you. About 40 family members and friends attended the birthday party. Some were from the 50 years Mitton lived in Quincy, on Independence Avenue; she moved from there to Holbrook seven years ago. Among them were the Smiths, who she housed and took care of like her own family years ago. Opinionated, upbeat and energetic, Mitton lives with two of her five children: daughter Carole Newcomb and son Wainwright. He is named after her late husband, a baker who died in 1999 at age 96, just shy of 70 years of marriage. Her other three children have died, but she has 11 grandchildren and 10 great-grandchildren. Born in Charlestown of Scottish heritage, Mitton has quite good hearing and good vision, and in many ways she runs the household. She does light household cleaning, pays her bills and helps decide the daily schedule. For example, for her birthday, she decided to have new granite countertops installed and had the kitchen repainted in blue and white. Mitton raised her children in Clinton and then near Central Square in Cambridge, where her husband owned My Own Donuts, a doughnut shop. They bought their house in Quincy in 1949. Dana Wilson, who is married to Mitton’s grandson Charles Pratt of Grafton, calls her Nana, enjoys her sense of humor and finds her an inspiration. You hear that media? A 100-year-old woman is one up on you. She's actually read the book. Jon David is not his real name. 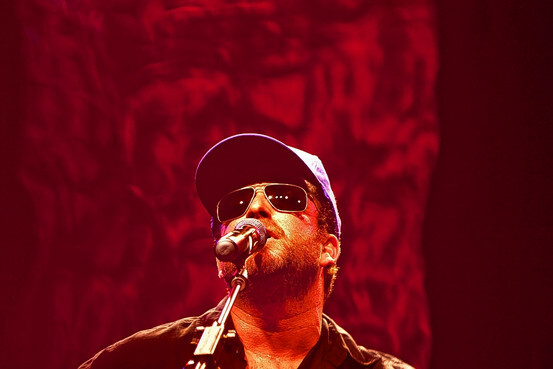 The guy in the spotlight singing "American Heart," it can now be revealed, is 42-year-old Jonathan Kahn, a Hollywood screenwriter, director and scribbler of songs whose faith in America doesn't extend to the place he calls home. Fearful of being ostracized in the town where he peddles his songs and scripts, Mr. Kahn has gone sub rosa on the rally circuit. "It's for protective reasons," he says. "In Hollywood, being a conservative is the kiss of death..."
He debuted his song on stage in Quincy, Ill., at a tea-party rally in September. "All those flags, those good folks," he says. "It moved me beyond belief." He went on to open for Ms. Palin, the former Alaska governor, at the Tea Party Convention last February in Nashville. He was the main musical act two weeks later at the $275-a-seat Presidential Banquet at the Conservative Political Action Conference in Washington. "American Heart" now has its own website and is big on YouTube. Ms. Palin called the tune "an amazing love song for America." Red Sox pitching legend Curt Schilling said it's "as powerful and moving as anything I've ever heard." Former United Nations Ambassador John Bolton recommends it to foreigners "who want to know how the real America feels." Mr. Kahn's older brother, Bob, isn't sure how he feels. The 8th-grade science teacher says he is proud of his brother, but concedes this new career path has caused distress at home. "Jon came back from one rally with a picture of him with Palin and my wife flat out refused to look at it," he says. "She ran into the other room." "She thinks I'm a right-wing nut job," Mr. Kahn says of his sister-in-law. His queasiness over his political persona isn't unusual for a town famed for its liberalism and fund-raising prowess for Democratic presidential candidates. It's also a place that lives and dies on image. "His dilemma is the dilemma of countless people in my life," says Andrew Breitbart, the conservative columnist and provocateur who runs a website, Big Hollywood, devoted to airing conservative grievances about Los Angeles. "You can survive here as a conservative, but it takes guile." One person stunned to hear of Mr. Kahn's double life as a tea-party troubadour is top Hollywood record producer and Grammy Award-winner Walter Afanasieff. The two have worked on projects for years and are now midway through writing and producing an album for a young singer. "And I'm just finding out about this now? Oh my God, I'm getting chills hearing it," Mr. Afanasieff says, when informed of his friend's sideline. "I mean, he's a member of a huge, Democratic, liberal organization called the Los Angeles entertainment business." After digesting the news, he adds, "It's very wise he's going incognito." Mr. Kahn grew up a doctor's son in Pacific Palisades, home to Sunset Boulevard, Steven Spielberg and Tom Hanks. His topspin forehand earned him a slot on the Stanford tennis team. His first film, a 30-minute male-bonding movie called "The Chili Con Carne Club," earned him raves. Two of his scripts became full-length features, including a 1998 teen drama he directed called "Girl," for which he wrote much of the soundtrack. One reviewer described it as "awash in a haze of teenage confusion, guitar feedback, and cigarette smoke." His rock band, The Color Green, has released three albums. Politically, Mr. Kahn says, "I've lived in the shadows my whole adult life." His politics are a frothy blend of patriotism and self-reliance, formed partly by the rough-and-tumble of trying to make it in Hollywood. "I don't believe in handouts," he says. "I believe in personal responsibility." He hates what he sees as Hollywood's core hypocrisy: "how it benefits so much from capitalism and bashes it at the same time." Mr. Kahn penned his patriotic ode in a late-night rush early last summer after a woman confronted him at a Venice Beach barbecue. "She listed what was wrong with America going back to the dinosaurs," he says. "I asked if she liked this country, and she said 'No.' I was shocked..."
The big Missouri rally earlier this month, it turns out, marked a turning point for Mr. Kahn's alter ego, Jon David. After belting out his anthem to a packed hall of some 5,000 faithful, Mr. Kahn got a big high-five backstage from Ms. Palin, the evening's main attraction. After her speech, she saw him without his signature shades. "Where are your glasses?" she asked, posing with him for a photo. "I'm burning my boats," he replied. After much agonizing, he explained later, he has decided to chuck the glasses, the hat and the fake name. "It's time," he says. The double identity has become confusing. "I have two email addresses, two post-office boxes. Sometimes I go to parties and say I'm Jon David." Less clear is what his Hollywood career holds. After Mr. Afanasieff, the record producer, heard the news about his friend, he sent Mr. Kahn a text message: "Tea Party? Really?" I'm planning to move my family and extended family into Mexico for my health, and I would like to ask you to assist me. We're planning to simply walk across the border from the U.S. into Mexico, and we'll need your help to make a few arrangements. I'm sure they handle those things the same way you do here.So,would you mind telling your buddy, President Calderon, that I'm on my way over ? 2. English-speaking government bureaucrats for all services I might need,whether I use them or not. 5. Tell the schools they need to include classes on American culture and history. 8. I will need a Mexican driver's licence so I can get easy access to government services. 9. I do plan to get a car and drive in Mexico, but I don't plan to purchase car insurance, and I probably won't make any special effort to learn traffic laws. 10. In case one of the Mexican police does not get the memo from their President to leave me alone, please be sure that every patrol car has at least one English-speaking officer. 11. I plan to fly the U.S. flag from my housetop, put U.S. flag decals on my car, and have a gigantic celebration on July 4th. I do not want any complaints or comments from the locals. 12. I would also like to have a job without paying any taxes or have any labor or tax laws enforced on any business I may start. 13. Please have the President tell the Mexican people to be extremely nice and never say critical things about me or my family, or about the strain we might place on the economy. 16. I'll need income tax credits so that although I don;t pay Mexican taxes, I'll receive money from the Government. 17. Please arrange it so the Mexican Government pays $4,500 to help me buy a new car. I know these are easy requests because you already do all these things for all his people who walk over to the U.S. from Mexico. 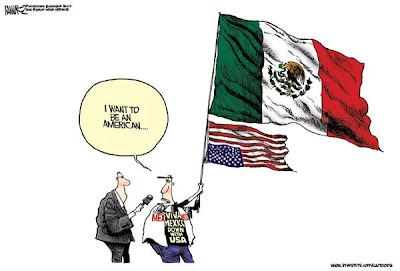 I am sure that President Calderon won't mind returning the favor if you ask him nicely. It's easy to get discouraged by some of the big-name, media frontrunners. If we had to vote today for president and vice president and could choose anyone for those positions, I can tell you who would get my write-in votes – Sen. Jim DeMint and Rep. Michele Bachmann. 1 - Who cares what Joe Farah thinks anyway? Nobody, but since there are others who think like him, I shall keep going. McCain is most likely going to win. McCain will be a valuable ally against Mitt Romney. McCain, for all of his obvious faults, is good on about half of the issues, especially foreign policy. And like it or not, John McCain has been one of the big media voices out there lately supporting things like the new Arizona law. He still has appeal with the middle. Now, is he sincere? Not likely. But that's for the voters of Arizona to decide. The McCain endorsement was done out of loyalty and because Palin promised to stump for McCain long before JD Hayworth jumped into the race. Palin supporters are not zombies. A good many Palin supporters are also big JD supporters. All reasonable conservatives understand Palin's reasons and have moved on. It only bugs those who lack the ability to see beyond the end of their nose. Carly Fiorina is not a RINO. Shut up, DeVore supporters. I know you're all bitter because Palin didn't endorse your guy. That's fine. I can understand that. But don't spread around garbage like Carly isn't really pro-life. Sarah Palin endorsed Carly because Tom Campbell is the real RINO in the race and he's LEADING! Carly is number two. Could Palin have endorsed the guy in third place? Sure. Would it have been enough to get him to overtake both Carly and Tom? If that's a RINO, then so am I. If you want a politician that you agree with 100%, you're just going to have to run for office yourself, because that's the only way it will happen. Perhaps Joe might also remember that Reagan endorsed people who were far more liberal than anyone Sarah has backed so far. Joe, is it too much to ask that you think about these things rationally, like an adult? If Chuck is still sagging in the polls come election time, go ahead and vote for him if you want to. But don't come cryin' to me when Campbell loses to Boxer in the general election. I'm sorry, but Palin was the one major GOP player who personally stood beside the Governor of Arizona backing the Arizona law and co-founded a website and Facebook page in support of it. Not sure where you're getting "squishy" from, Joe. Perhaps the 2008 campaign when she was supposed to parrot McCain? Well, it looks like McCain is now parroting her. And might I remind you that Ronald Reagan pushed though amnesty? Good people. But it would never happen. And personally, I don't like their lack of executive experience. We need 'em in Congress. On the same day the Albuquerque Journal released a poll showing Martinez in a virtual tie with Allen Weh, the 2008 Republican Vice Presidential candidate offered her support to Martinez. 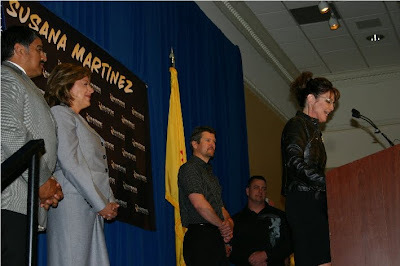 In a speech that hit on many Republican tent pole issues, Palin highlighted three major issues in New Mexico, ethics reform, the budget and corruption. For the crowd, the event was not only a chance to hear Palin, but to also to find out more about Martinez, the Doña Ana County District Attorney, who was dismissed as a “regional candidate” earlier in the race. “I’ll just judge each candidate,” Roger Pimkins told The Independent. Pimkins said he’s undecided between Martinez and Weh. He said while it’s nice to hear from Palin, her appearance wouldn’t affect his decision when has casts his ballot.